Necessary tool for flywheel removal. Quality product that worked great and just as it should. This is a necessity if your removing your flywheel and this is the cheapest puller and works great! It's a puller, it works fine! Don't loan it out and you won't have to buy a second one like i did! Worked perfect and arrived on time. Really haven't had any issues with tusk products. 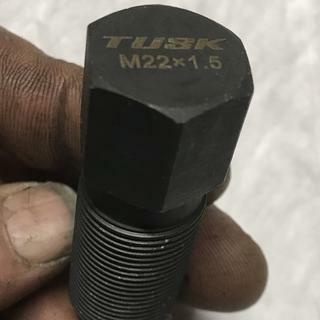 Why would Tusk use coarse threads on a flywheel puller?? Worked the flywheel popped off easy. the tool is well finished, fits correctly, and works well. Great price too! Tusk is always so helpful, having all the parts and special tools at a fraction of the cost. Great quality flywheel puller, works perfect! Thanks Rocky Mountain and tusk! Worked great and as expected for me . I never have torn down an engine that far before but it really was a piece of cake . made installing my new flywheel a breeze. cheap and a must have for pulling the flywheel! Works amazing and does exactly what I need it to! I was replacing my cam chain so a flywheel puller was needed! That's where the Tusk Flywheel Pulled came in handy and what a releif it was to have! I am happy to add this to my tool collection! 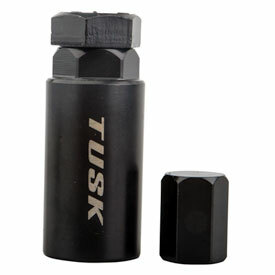 I’d recommend the tusk brand tools to anyone doing a bottom end job. I used the crank puller/installer, case splitter, and flywheel puller and they made my life so much easier! I purchased it to service my KLR650, worked like a charm, for the price and its use it just cant be beat! Black oxide coating so it shouldn’t rust, if you have numerous pullers like me the markings on the head are a nice touch and hope they hold up. I recommend if you’re doing the doo on Your KLR, and on a budget this tool works great! only used it one time worked great. This flywheel puller is well made and very durable. Does the job. Did exactly what it was intended to do. I had no issues and is a pretty straightforward design. Pulled the flywheel off my KTM without issue. Excellent value and high quality. Does the job it was designed for with ease. We also have the Tusk case puller kit and it has been used by myself and my friends multiple times. These tools will last. Cheap and worked very well. makes removal very easy. Good quality for low price. Tool is easy to use pretty self explanatory. Flywheel came right off. this puller is well constructed and worked exactly as it should . Simple design. Work as it should. Must have tool for flywheel removal. Wouldn’t mind seeing the wall thickness of the flywheel attachment being a bit more robust. Had concerns in that area when placing heavy torque on the tool at initial pull. Did its job!!! Worked like a champ. And quality of the puller is just as good if not better than higher end more expensive ones I use. Must have in any bikers toolbox. Worked great in the removal of my YFZ450 fly wheel! Inexpensive and worked perfect. Simple but necessary tool. Worked great on my buddy kx 85. Makes getting to job done easier. at the price I was expecting some cheap piece of garbage, boy was I wrong this is a well built tool made of heavy steel. It worked perfectly with no problems at all ..Don't try to get the flywheel off without it. A great tool from a real tool! I got this flywheel puller after trying everything to get it off. Including a pipe wrench. I screwed the puller on and put my ratchet on the center nut and with one mighty push it snapped. I thought I had broke something but yeah! It was lose. A great tool!! Couldn’t ask for a better tool to use! Worked perfectly! I have used other brands and this tusk is by far the best one I have ever used! IT WORKS GREAT, EVERYTHING I COULD EXPECT AND MORE, THIS MADE ALL MY DREAMS COME TRUE. Superior because it has a hex machined into the puller body not two flats . This allows a wrench on the puller going into the flywheel for better grip on the threads . Better design puller than most . This product worked awsome. Just like it should,popped my flywheel right off. For the money you cant beat it. Thanks Tusk for making affordable specialty tools. This one works flawlessly like every other one i've purchased. Greased as directed and very easy rotor removal. One time use. Worked perfectly. Not much to say. It works perfect on my 2000 ktm 250sx. Easy to use. No damage done. Worked as described. Could not pull the flywheel any other way. It took quite a bit of force to get it off. Cant go wrong for the price. Super easy to use and fit great on my 2004 CR125R. The puller I bought for a 2017 KX 450F has 3 pieces. One of the pieces appears that it threads onto the bolt the flywheel is mounted on. It appears to protect the threads on the bolt the flywheel sits on, is this correct? The problem is that thread protector appears to be larger than the clearance of the flywheel. I thought about backing the hex nut back off a little or not using the small hex nut. A little advise before I try this please. BEST ANSWER: Watch "Tusk Motorcycle Flywheel Puller" on YouTube. 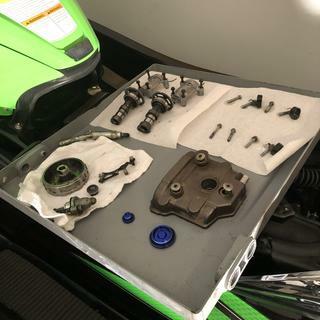 You're supposed to remove the nut that holds the flywheel on to the crankshaft first using the flywheel spanner wrench to hold the flywheel in place and remove the nut with a socket wrench. Once the nut is removed you need remove the washer that sits behind that nut. Next you will install the flywheel puller. The flywheel puller threads on to the flywheel where the crankshaft nut was. It is designed to push on the crankshaft and pull the flywheel off with the Tusk flywheel puller at the same time. Watch the video and it will definitely help you. Perry, thank you for quick response. I have removed the nut holding the flywheel on the crank. The flywheel puller I bought has 3 pieces. One is a small hex nut and threads on the crank to protect the crank threads, but it appears there is not enough clearance for the flywheel to clear the hex nut once I put the rest of the puller on the flywheel. Can I back the hex nut off slightly so that Im not putting pressure on the the flywheel itself while I apply pressure to flywheel puller? It’s to protect the end of the crankshaft. The little nut did not fit my crank either. I just used the tool without it. I was just very careful when cranking in and you just need a few turns to break the flywheel loose. It will fit fine. Absolutely need to use the crank end cover as oil feed for the crank and the rest of the motor goes thru that hole. Don’t want to mess it up. If you round up it should. Will this work on 2016 tm racing 300en? BEST ANSWER: you would have to measure the flywheel to get a more accurate fit. Will this fit a 2011 KTM 350 sxf? Will this work for a 2005 Suzuki king quad? Does Tusk make one that works on a 1990 KTM 250? BEST ANSWER: We make a puller for the 1999 250 mxc, exc, and the sx. so it depends on what bike you have. how do i select by size not vehicle type? BEST ANSWER: We have them linked to machines not by size. If you need a different size than what is listed for your machine you would have to cross reference part numbers and sizes. Will this puller work on my 2009 400 xc-f KTM? BEST ANSWER: You will want Part# 1179010008 for your particular application.